With key topics, such as automation, individualisation, customisation and sustainability, the range of technologies at the coming Texprocess is more comprehensive than ever. 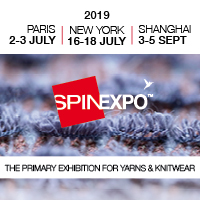 Four months before its start, the leading international trade fair for the processing of textile and flexible materials is almost booked up, according to organisers. Trade visitors from the fashion and clothing industry, upholstered-furniture manufacturers and all processors of textiles will find an even broader range of machinery and methods for processing textile and flexible materials at Texprocess, from 14-17 May 2019. Once again in its level of bookings Texprocess is exceeding the results of the previous event. “The coming Texprocess will be taking off even further. While on all sides people are talking of Industry 4.0, at Texprocess we are now talking of Impact 4.0. Trade visitors will find an impressive range of technologies which in every respect are having formative effects on the way we manufacture and process textiles, effects which will continue in future,” said Olaf Schmidt, Vice President Textiles and Textile Technologies at Messe Frankfurt. Among the exhibitors registered will be all international market leaders, including Amann, Brother, Dürkopp Adler, Human Solutions, Juki Central Europe, Morgan Tecnica, Pfaff, Tajima, Veit and Vetron. Following a temporary absence, Sunstar will be one of those represented at Texprocess again. Among those which have registered for the first time are Browzwear Solutions, Lasembor, INL International Technology, Siruba Latin America and Summa NV. China, Japan and Taiwan have registered for national pavilions. Micro-factories will be the focal subject at the coming Texprocess. The show currently features four micro-factories. The Digital Textile Micro-Factory at Texprocess and Techtextil, in collaboration with the Denkendorf Institutes for Textile and Fibre Research (DITF) and partners from industry, will be presenting three production lines in Hall 4.1 alone. RWTH Aachen University, jointly with various partners from industry and research, will be producing a smart cushion in its Smart Textiles Micro-Factory in the passage between Halls 4.1 and 5.1. Six firms working in several fields – visualisation, CAD cutting systems, automated body-mass calculation, layout and process automation – have also come together under the umbrella concept World of Digital Fashion. In Hall 4.0 they will be jointly showing the ways in which their products can be integrated and combined in various different workflows within the value-added chain. Additionally, Efka, a manufacturer of industrial sewing-machine drive systems, and CAD specialist Gemini will be showing how to produce individually designed football shirts. The micro-factory presents an easy solution that most companies can implement using existing resources and structures. Sustainability is once again one of the central themes of the upcoming Techtextil and Texprocess. For the first time, the two fairs will be showcasing their exhibitors’ efforts towards sustainability. The Techtextil and Texprocess Innovation Awards give prizes for sustainable textile innovations and processing approaches. In addition, the Texprocess Forum will offer a thematic block exclusively around the theme of sustainability in the textile and fashion industry, with an offshoot of Fashionsustain, Messe Frankfurt’s conference about sustainable textile innovations. For the first time, Techtextil and concurrent Texprocess will be sharing an exhibition hall in 2019. In Hall 4.1 Texprocess will be showing its Digital Textile Micro-Factory, with one production line each for clothing, shoes and the processing of technical textiles. In addition, exhibitors will be featuring product preparation, finishing, textile logistics, internal materials flow and textile conditioning, plus suppliers of sewing solutions. The Texprocess Special Treatment Area will also be located there, with exhibitors from the effect-finishing segment. Also in Hall 4.1, Techtextil will be showcasing some of the suppliers of woven, laid web, braided and knitted fabrics, coated textiles, and nonwovens, as well as selected suppliers of textile machines. Suppliers of functional apparel textiles mark the transition to Texprocess. In the shared hall, visitors will get an insight into the entire production process, from raw material to finished product. The Texprocess Forum will be featuring talks by experts on current topics in the industry. For the first time Messe Frankfurt will also be bringing a section from its conference at Berlin Fashion Week to Texprocess in Frankfurt, in the shape of Fashionsustain Berlin, thus providing a bridge to the sustainable end product. For the fifth time Messe Frankfurt will be honouring the best new technological developments through its Texprocess Innovation Award. Entries for the prize are possible up to 18 February 2019. The prizes in the various categories will be awarded during the joint opening event of Texprocess and Techtextil on 14 May 2019.